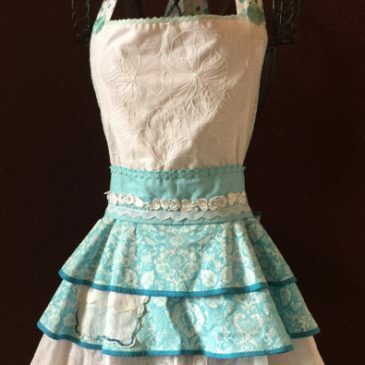 I made this artistic apron using blue stretch cotton fabric, assortment of vintage and modern lace, vintagedoilies for pockets, intricatly designed bias tape, embellished with ribbons and findings to create this stunning apron. I love mixing fabrics to combine an unusual finish. Full bib, 3 swing skirt makes this Teal Gardens apron a romantic must! Won Donated Award American Sewing Guild 2016! 1st Place Sewing Award San Diego Fair 2016!! Available on Etsy!! !